Which Films Are You Looking Forward To Finishing Off 2010 With? With the news that The Hobbit is taking one step there and two steps back again, one of the most sought after films on the horizon looks unlikely to hit our screens any time soon. A crying shame for film fans that are looking for something, anything to look forward to, after what has been a year substantially lacking in lustre. Inception and Toy Story 3 aside, 2010 has offered very little so far in terms of history making cinema, blockbusting thrills or quotable comedies. With three months to go, can this change? Can 2010 go out in style? As comedy pairings go, Robert Downey Jr and Zach Galifianakas are the current Kings of the Hollywood Castle. 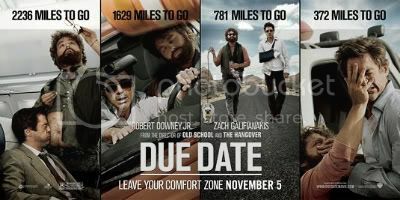 Due Date sees Bob trying to get home to the birth of his son and having to hook up with beardy Zach to get there, with tension and hilarity set to ensue. Offering more than a passing similarity to the John Candy/Steve Martin vehicle listed below, the fact that Todd Philips is at the helm (Hangover, Borat, All The King’s Men) should steady the nervous hands of studios looking for this year’s sleeper comedy. Whether you’re for or against Harold Potter (more thoughts here) HP7:TDH looks set to be bigger than Jesus. While every film in the series has threatened to “go darker” Hallows finally looks set to stand by this promise. Like the Star Wars prequels it also has the added benefit of improving on its former parts ten fold. Like Sith, this is what, even non-Potter fans must agree, it’s all been building up to. Surely the ball won’t be dropped at the last act? If you’ve ever read the story of “The Taffy Scarface”, and not just ironically used the front cover for roach, you’ll already know the almost unbelievable story of Howard Marks. Drug Smuggler, Spy, Political Activist, Super Furry Animal, Criminal, Hero, and everything in between. Unsurprisingly Rhys Ifans has bagged the lead, possibly for being the Welshiest Welshman since Daffyd Gareth Leekface. Move over Jack, Clooney is the new Oscar love. In the past few years Good Night and Good Luck, Michael Clayton and Up In The Air have guaranteed Gorgeous George front row tickets to any awards cermony in town. The American, a tale of a hitman and his final job, looks set to continue the run. Think Grosse Pointe Blank without the laughs or The Violent Femmes. Having topped the list of many critics best films of 2009, the powers that be couldn’t keep their hands off Tomas Alfredson’s exquisite Vampire drama, Let The Right One In, for more than 12 months. For people that “dun reed gud” the film has been shifted from Sweden to New Mexico. While this type of cack-handed anti-intellectualism and downright laziness should be made illegal, early word has it that Cloverfield director Matt Reeves has actually achieved something fresh. This almost annoyingly positive critical reception, from people who thought the remake was as foolish as dipping your balls in honey and then wrestling a bear, has made Let Me In more of a curiosity than a certain avoidance. Foolish idea or not, changing the boys name from Oskar to Owen… I’m with them on that. My personal ‘one to watch’: The Social Network. The trailer featuring that version of Creep coupled with the most believable of breakdowns between friends, plus David ‘Flawless’ Fincher all adds up to everything a great movie should be. But what say you? Anything out there you’re chomping at the bit to see before the year’s end?